Raising ducks provides a variety of services and products including very edible eggs, humanely raised and harvested meat, excellent compost material, elimination of weeds, slugs, snails and other pests, and entertainment. Don’t forget the entertainment. I’ve raised ducks since I was a child and currently still have a few around, and they always live up to their image of perpetually having no idea what they’re doing, but going around doing it anyway. Plus, ducks can be quite weatherproof and low maintenance if the correct fencing is in tact. And they come in a rainbow of interesting heritage breeds. 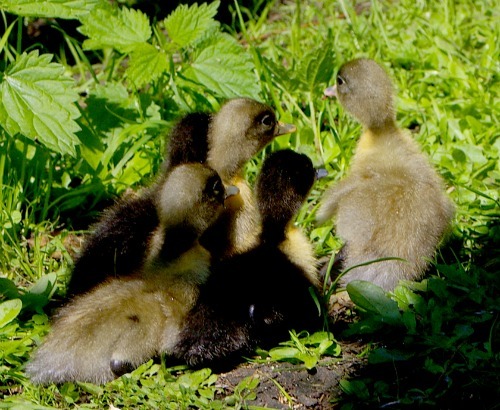 The photo above are our Swedish blue/Rouen cross ducklings. 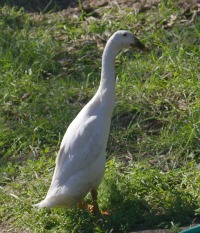 Many of us are familiar with the Pekin duck -- white with orange legs, feet and bill (Donald Duck). This breed originated in China and came to the western world mostly as meat birds because of their ample breast meat and light yellow skin. This is the most plentiful domestic duck in North America, and has been selected to grow extremely fast. But Donald has many colorful and unique cousins including the Swedish, Ancona, Aylesbury, Magpie, Saxony, Silver Appleyard, Welsh Harlequin, Rouen, Campbell, Buff and Runner. Ducks are omnivores like chickens, and they love to forage, hunting for a huge variety of foods including slugs, snails, pill bugs, tender greens and rotting fruit fallen from the tree or vine. Like chickens, ducks need grit, usually in the form of sand or tiny rocks they ingest with their food. It remains in their gizzards where -- in place of teeth -- it grinds up their food. Foraging ducks often consume their own grit. Unlike chickens, ducks especially need to sift their bills through water puddles and mud, and need lots of drinking water to help them digest their food. Some homesteading duck owners with just two or three ducks don’t purchase feed at all except for use during rare winter snow, as long as the ducks have ongoing access to diverse freerange that includes organic bug-hunting and natural flora. The occasional sprinkle of oatmeal can be used as treats to entice them to come to you when needed. If ducks are raised in a smaller pen or for whatever reason one chooses to use supplemental feed, there are commercial organic duck feeds available. If using purchased feed, make sure it’s compatible with ducks, as medicated feed meant for chickens can cause health issues with ducks. Some feeds are all purpose, some break down into categories for ducklings, drakes (male ducks) and non-layers, and layers. Then make sure they have deep dishes of water always available especially if their main food source is a dry feed. And sprinkle supplemental grit you can find at feed stores on or near their food if they don’t have access to foraging for it on their own. Fish meal and crab meal work well for ducks as a protein supplement that also provides many trace minerals possibly not available from land sources, as does kelp and alfalfa meal (the latter which comes from a plant with a very deep taproot that mines minerals from far within the earth.) Ducks love most grains, but for year-round feeding, sprouted grains provide an excellent food source. Homesteaders with surplus dairy may find that ducks enjoy cottage cheese, yogurt, buttermilk and milk -- though their humans should clean up anything that’s leftover and could get infected. Some homesteaders and farmers prefer to concoct their own dry feed mix. The many suggestions and variations for percentages and weights are beyond the scope of this article. But the best advice I can give is that there is not just one formula that every duck and every homesteader approves of, therefore, start by comparing three different eco-friendly homemade formulas, then choose one and begin there. You may want to view it as a starting point to tweak and refine over the years. 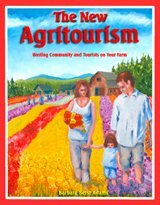 For starters, readers may find Harvey Ussery’s The Modern Homestead website and/or his book, The Small-Scale Poultry Flock to be very helpful. Ussery says that he raises both ducks and chickens together so wants to keep things simple and makes a compromise feed for both chickens and waterfowl. He explains that the major difference in their nutritional requirements is that waterfowl should consume more B vitamins, particularly niacin, so he adds cultured dried yeast to the mix to boost B vitamin content, feeding the same mixture to both types of birds. Whenever feeding ducks, remember they are like people when it comes to food. Whereas most of us like pizza, some don’t. And we’re conditioned by our childhood feeding habits. Same for ducks. For the first ducklings I raised as a child, I cut up dandelion greens along with their yellow flowers and put them in the ducks’ water and mixed them with their other favorite foods (including cottage cheese snuck from the refrigerator). When they became adult ducks patrolling our backyard, they’d devour a dandelion plant to the ground like aggressive duck-shaped land paranha. My later ducks which had not been raised on dandelions and cottage cheese would barely nibble on dandelion and hated leftover cottage cheese -- literally ran away from it when it was offered like they thought I was plotting to poison them. Protect your garden from ducks. While they can eradicate slugs and other pests from a garden, they can also eradicate the garden itself while they’re at it, depending on what’s growing there. If it’s newly planted, ducks love to trudge over soft soil with their flat feet and drilling bills, picking up bugs, grit and maybe the carrot seeds you just planted. More mature gardens with tender greens and low growing fruits such as strawberries are also in peril. Both should be fenced off from ducks during the growing season. Portable electric woven fencing often works for this purpose. Ducks can then clean up, de-pest, and fertilize the garden after the growing season, and patrol only the outer edges from migrating pests such as slugs during the rest of the season. Water: As mentioned above, ducks need ample water to sift through and to digest their food -- literally to keep from dry choking. But they also use it to dip their heads completely under which is good for their eyes and nostrils. (See more under how ducks are different from chickens below). Social instincts: Like chickens, ducks are flocking birds and function with others of their kind near them. The idea of social needs can sound silly for animals, but they are powerful instinctual drives to keep them alive, and they can't be eliminated by rolling our eyes and ignoring the need. I've seen single ducks and single ducklings -- the only survivors after a predator attack on their flock, come out of the attack physically healthy, only to settle down in a corner and slowly die when not immediately introduced to new flock members. Also, though, over crowded conditions are stressful. But two or three ducks to a large backyard or three or four to a small barnyard usually works well. In general, keep only one male to one to five females, or just keep all males. More about this below. Weather hardiness: Ducks are very hardy, with a layer of insulating fat and thick waterproof feathers that even allow them to swim in water when the temperature outside is below freezing, as long as the farm's water itself hasn’t yet frozen. Rain usually rolls off their backs and they often love rain, meaning there will soon be more mud and puddles to sift through. During sub-freezing icy conditions with high winds, my ducks like to huddle together and hunker down on the ground so their plump bodies keep their legs and feet warm. And as waterproof as they are, even adult ducks can eventually saturate. 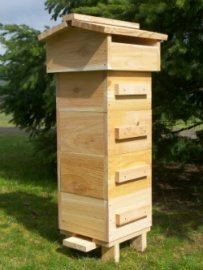 For reasons of weather, they can get by with something as simple as an old wooden crate laid on its side padded with dry straw, and with the open side opposite of prevailing winds. Predators: But predator issues may call for more elaborate protection. Wild ducks can take to large bodies of water or flight to escape both night and daytime predators. They can even dip below the surface of the water to escape birds of prey. But domestic ducks need a predator proof yard to avoid eventually succumbing to the usual suspects: dogs, birds of prey, foxes, coyotes, minks, raccoons, and so on. I even had a large raven land next to one of my foraging female ducks. It started chasing her around on the ground until I started chasing it around until it flew away. Like chickens, ducks’ predators can attack them from above and from the ground, but also by digging under the ground to get inside an enclosure. That’s why some homesteaders lay about a foot of chicken wire on the ground around the pen, which discourages predators from digging into the pen day or night. In some instances, ducks do well without protective fences or shelters to completely free-range in barnyards or pastures if family dogs in the area chase away ground predators, and for whatever reason, some homesteaders remain lucky enough that flight predators seem content to be occupied elsewhere. The effects of flat feet. With their natural scuba-fins, ducks don’t scratch up and aerate the ground as chickens do. In fact, their feet’s effects on the ground over time are somewhat akin to a steamroller’s. However, they’re pretty good at aerating the ground with their bills as they drill into it foraging for food. Some feel they are excellent at removing lawn thatch. Swimming: Most ducks love to have a pool to swim in and preen properly, though it’s not necessary as long as they can dip their entire heads into their water dish. Some homesteaders use small kiddy pools with stepping stones near an edge to make the pool easy to enter and exit. I’ve even set out old jumbo roasting pans filled with water that the ducks loved to climb and dip into. But though it seems all ducks take to water as instinct, I decided to buy a kiddy pool for a small flock I’d raised on dry land with just a watering dish since they were ducklings. Scared the heck out of them. They got used to the pool enough to drink from it, but though they can easily climb in and out, they never attempted. Noise variations: When keeping chickens in town, most ordinances don’t allow loud roosters -- only the quieter hens. With ducks, it’s she who has the loud quack. Male ducks sound like they’re trying to quack but have chronic laryngitis, so are very quiet. If a town homesteader wants a very quiet flock for slug patrol and/or meat and no eggs, a group of males may be the best. Though it’s arguable as to whether female duck quacking compares to the volume of a crowing rooster, do be aware of the differences in volume. Also, unlike a group of roosters who will fight to the end, a group of only drakes usually get along fine and are generally not aggressive towards people as roosters can be. (But add a female with the drakes, and you know what will happen.) If raising both genders together, never have more males than females. She gets exhausted from too much action while the guys fight and bicker over whose turn it is. Herding ducks: When it comes to getting ducks where you want them to be, ducks ‘herd’ whereas chickens ‘scatter.’ One can easily convince a flock of ducks to file into a specific area. Chickens somehow know how to leap in the opposite direction of where we’d like them to go. Even when we use reverse psychology and pretend we want chickens to go left (in hopes they’ll go right), they figure it out and go right anyway -- or even straight up. Sleeping patterns: Ducks and chickens have very different sleeping patterns. Ducks are perpetually busy unless it’s naptime, which can be any time day or night, and anywhere, including the middle of the day out on a nice warm asphalt street making cars drive around them. Chickens can also be busy but tend to maintain an attitude that life isn’t quite as exciting as the ducks would think. While chickens may bask in the sun and take dust baths during the day, unlike ducks, they march to bed to roost at dusk and sleep soundly all night like preprogrammed robots. Ducklings can drown: There are a few things to watch out for if raising ducklings. First, if raising them on the farm without a caretaking mother duck, realize that though ducklings instinctively know how to swim, they aren’t yet waterproof and can drown. It’s common to see newly hatched mallard ducklings bobbing in the lake behind their mothers, but the oil that makes their feathers waterproof comes from their mother as they sleep in the nest with her. Without it, their down can saturate and weigh them down, and if the water container isn’t shallow and simple to get out of, they can become too exhausted to keep themselves up. They’ll be waterproof on their own when they have their own actual feathers. Watch out for drakes: Drakes can be real jerks when it comes to ducklings. In nature, the drake and female duck choose each other by instinctual preference for just a short term relationship, they weren’t forced into an arranged longterm marriage as on farm and homestead settings. In the wild they usually stay together only until the eggs are all laid in a safe nest and then begin to hatch. On the homestead where flightless domestic drakes must hang around in the same contained yard or pen as the newly hatched ducklings rather than follow their instincts to abandon, I’ve seen more than one breed of drake attack and kill ducklings. And yet in other settings, the drakes caused no problems if they had a lot of space to disappear away into, such as a completely different area of the orchard or barnyard, especially if joining other post-mating season drakes to hang out with as they would in a natural setting after the egg laying season is over. Believe me, she-duck doesn’t want him around either. But take heart if this sounds like poultry male bashing. Ganders -- (male geese) -- are very attentive fathers. 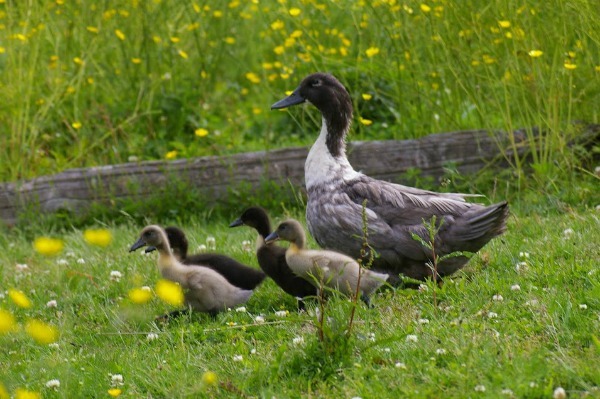 Domestic ganders have been known to adopt and raise ducklings and goslings all on their own, and to even show more interest in parenting than female geese in the same barnyard. Ducks just aren’t wired that way so be aware of the potential for danger. 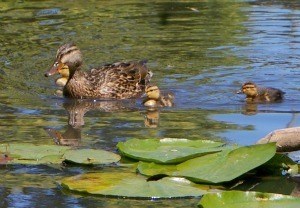 Going broody: Domestic ducks will go broody like chickens and choose to lay in a specific nest and incubate the eggs. It’s generally believed that Indian runners (pictured left) and Pekins rarely go broody and if so, leave the nest before the eggs hatch. My Pekin duck did get broody quite easily, though. She incubated the nest faithfully for a full term and was a very attentive mother after they hatched. Imprinting: Ducklings will imprint on the first large moving object they see as they emerge from their eggs. Most of us have seen the stories of goslings or ducklings that imprinted on the family dog or a human passerby if the mother wasn’t around during hatching. So if you want to raise ducklings cared for by a natural mother, make sure as they hatch from their eggs there’s no competition (such as you, curious children, or Fido) that they might imprint on instead. It’s impossible for her to care for them if they don’t follow her as nature intended, and instead keep seeking out a different mother object. Twice, however, the ducklings I raised didn’t imprint on their mother, nor me, nor anything it seemed. She’d try to get them to follow, but they’d take off chasing some illusive object which they never seemed to find. Did a wayward helium balloon fly over just as they were imprinting? 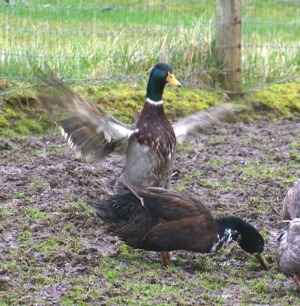 For all their daffy antics, ducks can often fool predators where chickens are easier targets. Their on and off again sleeping patterns keep them more alert 24/7. Dropping eggs in strange, meaningless places as they often do can create false trails for predators while leaving actual incubating nests safe. Ducks no doubt do have some idea of what they’re doing. It’s most likely more often we humans who often go around wondering why.